C.E. 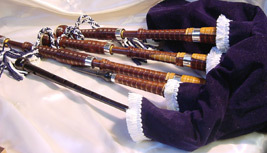 Kron & Co. has been making traditional Highland bagpipes with only the finest craftsmanship and materials since 1987. It is our passion for the instrument itself and a fanatical attention to the details that makes our pipes the best in production today. SHOPPING PAGES: BAGPIPES CHANTERS ETC.